ZURICH (Reuters) - A laboratory in Switzerland has created the smallest magazine cover in the world, using a tiny chisel to create an image so minute that 2,000 of them could fit on a grain of salt. 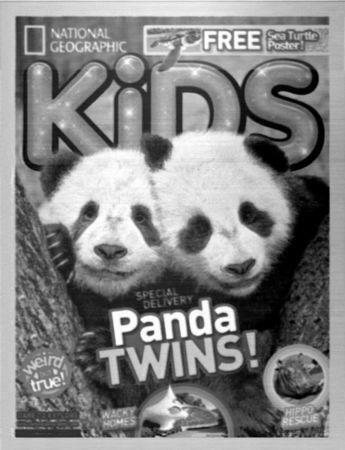 Scientists carved the 11x14-micrometre image of two pandas that appeared on last month's cover of the National Geographic Kids magazine onto a polymer using technology similar to 3D printing. The device, roughly the size of a family refrigerator, used a tiny chisel with a heatable silicon tip 100,000 times smaller than a sharpened pencil point to cut out the image. The technology could be used to make transistors, as well as nano-sized security tags to prevent the forgery of money, passports and artwork, scientists involved said. "The application range is quite broad," said Felix Holzner, chief executive of SwissLitho, a startup to which the IBM technology has been licensed. "It's like a 3D printer on a microscopic scale - you can make any structure you want but a million times smaller with this machine." At the moment, the high-tech machines, which cost around 500,000 euros ($691,500), are intended as research tools rather than for use in the production industry, Holzner said.